While it is the players on court that grab the attention and focus in basketball match, quite often games are decided long before players step onto the court. The work undertake by the coaches is often crucial in determining the winner of a game. It is also fair to say that a coach will often decide the outcome of a game thanks to the tactical switches they make during a match. This is where a team looking to win the 2014 Basketball World Cup needs to ensure that they have a great coach as well as great players. In this regard, you can see that Team USA have a lot to be confident about when they make their way to Spain. Mike Krzyzewski can call on four national championships and 2 gold medals from the Olympics but this summer, he is out to achieve something else. With Team USA facing strong competition from host nation Spain, there is a great deal of expectation being placed on the team and the role of the coach is likely to have a massive impact on the outcome of the big basketball event of the summer. The FIBA event is not the only World Cup taking place this summer, the soccer event hosted by FIFA is taking place in Brazil. It is not as though Krzyzewski is going to take too many tips from the soccer team for the assault on Spanish soil but there is something that the coach has noticed and admired about the approach of the soccer team. The USA team in Brazil, and the huge fan base, has shown a massive level of passion, and this is something that Krzyzewski would like to replicate in the basketball side. This is going to be something that Mike aims to install into his roster during the training camps which take place in the US before the team heads off to Europe. The biggest worry for Krzyzewski this summer is that if the US team are successful, he will be abroad until at least the 15th of September. Given that the opening two weeks of school fall before then and it is obvious that Krzyzewski has a choice to make. 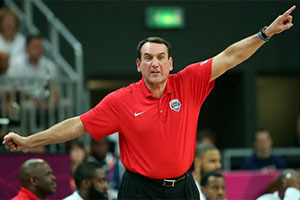 In this case, his country comes first but fans at Duke can rest assured that Krzyzewski is leaving them in good hands. A good coach builds up a strong team and these are the people that will be working hard to ensure Duke get off to a strong start at the beginning of the new campaign. There is also the beginning of the end to think about for Krzyzewski. He has been very open and clear about the fact that 2016 is going to be the final year of his time in charge. This means that there is going to be a focus on the Brazil Olympic Games. The fact that Brazil is the host for the 2014 FIFA World Cup and the 2016 Olympic Games is a curiosity but it may mean that Krzyzewski looks towards the US soccer team for further inspiration. Knowing what to expect when you play abroad is a great starting point and learning all about Brazil and the facilities on offer will be a major role of what Krzyzewski does in the year or two ahead.